Check out, What Are Audio Snakes, to learn more about their importance on church sound. There are three main parts to audio snakes. It is good to understand how the numbering system works between the inputs and outputs of the audio snake. The actual ends that connect are the same as microphone cables. The head of audio snakes is the part with XLR-F. 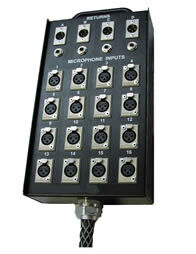 Here you plug in your desired instruments and microphones into. Next to each input, on the snake head, there are numbers. These numbers correspond directly to the other end of the snake. It is important that you remember and keep track of which inputs you plug in the snake. This will help guarantee that you know which instrument or vocalist is plugged into each channel. Along with XLR inputs on the snake head, there are some returns. These are usually used for the monitor signals and are normally labeled with letters (A-D). The body of audio snakes is the part that does the job of carrying the signal a distance. This is rather a wider and fatter cable and it is best to hide these in walls or along the floor and wall. This is the part of the snake that plugs into the soundboard. These ends are numbered and correspond with the numbers on stage. The ends of this snake will be XLR-M and then plug into the channels on the mixer. Most snakes that have return channels will have a few ¼ inch (or patch cord) ends. If you are running monitors off your soundboard, you can use these to ‘return’ the signal to the amplifiers. This same principal goes with the master outputs on the soundboard.